Spin caloritronics has emerged rapidly as an important branch of spintronics due to its potential prospects in waste heat recycling in today’s microelectronics. In this field, spin Seebeck effect (SSE), spin-dependent Seebeck effect (SDSE) and anomalous Nernst effect (ANE) attract focused interest due to their charming physical scenarios and potential applications. For example, SSE has been reported in many YIG (Y3Fe5O12)/heavy metals systems [Kikkawa et al. Phys. Rev. Lett. 110 (2013) 067207; Qu et al. Phys. Rev. Lett. 110 (2013) 067206]. However, none unambiguous demonstration of SSE in YIG/ferromagnetic metal systems has been realized yet. This YIG/ferromagnetic metal (FM) system probably bares more physics such as magnetization dependence of inverse spin Hall effect. However, the SSE in this system is more difficult to measure due to its entanglement with other spurious magnetothermoelectric effects such as planar Nernst effect (PNE) and anomalous Nernst effect (ANE) whose mechanism is still to be uncovered. Recently, M02 group led by Prof. X. F. Han of State Key Magnetic Laboratory in Institute of Physics creatively adopts an exchange bias structure to disentangle the SSE from PNE/ANE of FMs. As shown in Fig.1 (a), an exchange bias structure of YIG/Cu/NiFe/IrMn/Ta has been fabricated. The NiFe/IrMn exchange bias structure is applied to exchange bias the M-H loop of NiFe from that of YIG. YIG/Cu/NiFe core structure measures SSE via inverse spin Hall effect (ISHE) in the NiFe (Fig.1 (b)). Cu is inserted to minimize magnetic coupling between NiFe and YIG. Fig. 1(c) shows the measurement set-up. Heat flow is generated from electrodes A or C and magnetic field is applied along y-axis. In result, a voltage signal can be detected along x-axis on electrode B (Fig.1 (d)). Before this measurement, the PHE and anisotropy magnetoresistance (AMR) of the NiFe films was measured, which indicates M-H curves of the NiFe was successfully biased in the field range of 50-250 Oe (Fig.1 (e) and (f)). Therefore, the voltage signal around zero fields relating to magnetization switch of YIG could be unambiguously attributed to the SSE. Furthermore, the PNE can be fully canceled by simultaneously heating electrode A and C while the SSE is doubly enhanced (Fig.1 (g)). Therefore, the research group has not only successfully confirmed the existence of SSE in YIG/FM structure but also offered an ideal platform to research ISHE in FM systems. Related results have been published in the following article [Hao Wu, C. H. Wan, X. F. Han et al., Observation of pure inverse spin Hall effect in ferromagnetic metals via ferromagnetic/ antiferromagnetic exchange-bias structures, Phys. Rev. B 92 (2015) 054404]. Besides, the research group also designs an experiment to find out the mechanism behind another magnetothermoelectric effect, one-century-old anomalous Nernst effect. Ramos et al [Phys. Rev. B 90 (2014) 054422] and Pu et al [Phys. Rev. Lett. 101 (2008) 117208] have shown Mott relation of ANE coefficient with Seebeck coefficient in Fe3O4 and Ga1-xMnxAs system, respectively. Hesegawa et al [App. Phys. Lett. 106 (2015) 252405] has researched the relation between ANE coefficients of different perpendicular materials and their magnetic anisotropy energy. These pioneering works have indicated strong correlation among ANE, Seebeck effect and spin-orbit coupling (SOC) effect. However, a key step for the physics behind of ANE, research on the relation between ANE coefficient and anomalous Hall angle (θH) in the same material system with elevated SOC strength, is still lacking. M02 group led by Prof. X. F. Han elaborately designs a material system of [Pt(12/n nm)/Co(12/n nm)]n superlattices to finish the last key step towards the backside physical picture of the long-mysteries ANE. This superlattice system has not only relatively stable Seebeck coefficient and saturation magnetization but also increasing SOC strength with increasing the period n. As shown in Fig. 2, a monotonically increased ANE coefficient and θH with increasing n are indeed observed and these two parameters show high correlations and even linear dependence as n<6. This linear relation validates our theoretical results (Equation (1)) derived from a linear response theory [Bauer et al, Nat. Mater. 11 (2012) 391]. Here η, S, μ0 and M0 are ANE coefficient, Seebeck coefficient, magnetic permeability of vacuum and saturation magnetization, respectively. 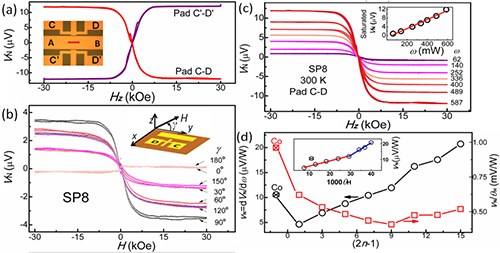 P, PT and Pθ are spin polarization of conductivity, thermoelectric conductivity and spin Hall angle in FM conductor, respectively. This formula describes the mechanism of ANE as following: temperature gradient generates a pure spin current in FM conductor via spin-dependent Seebeck coefficient, then this spin current is converted via inverse spin Hall effect as a transverse charge current and finally leads to ANE voltage signal. This work experimentally demonstrates linear relation between ANE coefficient and Hall angle which indicates the physics behind of ANE as interplay of spin-dependent Seebeck effect and inverse spin Hall effect in FM conductor and also predicts a giant ANE effect in a material system which has large Seebeck coefficient as well as strong SOC strength. 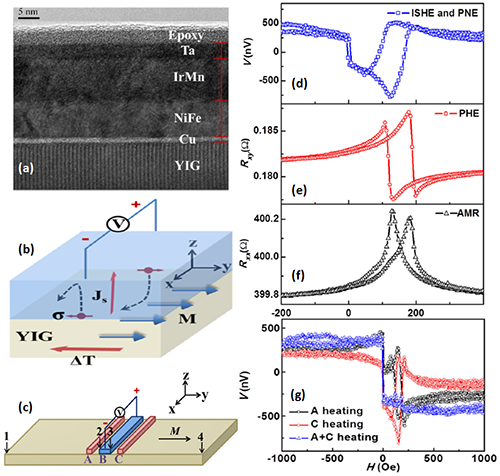 Related results have just been published in this following article [Chi Fang, C. H. Wan, X. F. Han et al., Scaling relation between anomalous Nernst and Hall effect in [Pt-Co]n multilayers, Phys. Rev. B 93 (2016) 054420]. These two works could deepen insights of community into some basic magneto-thermotransport phenomena and advance development of spin caloritronics. These works appreciate funding support from MOST, NSFC and XDB of CAS. Figure 1 (a) X-HRTEM of a sample, (b) physical picture of SSE, (c) measurement geometry, (d) thermoelectric signal as a function of field as heating A, (e) PHE and (f) AMR of a sample and (g) thermoelectric signal as heating A or C or simultaneously heating A and C.
Figure 2 (a) ANE voltage as a function of field, inset showing measurement setup, (b) angle dependence of ANE voltage, inset showing definition of the angle, (c) ANE voltage as a function of heating power of ω and (d) ANE coefficient (vN≡dVN/dvN/dθH) and ration of vN/θH as a function of the number of interfaces. Inset shows scaling relation between vN and θH.